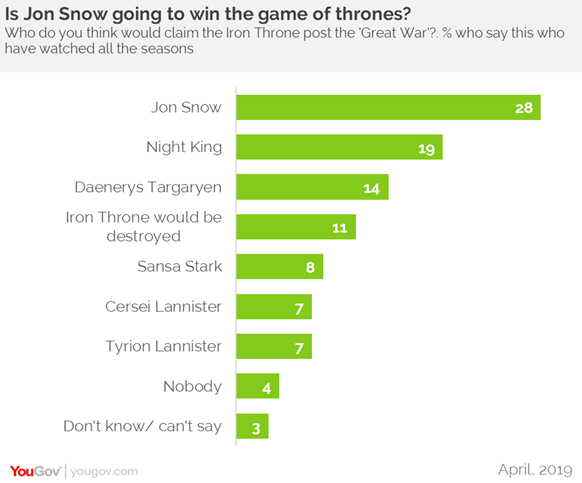 YouGov | Will Jon Snow win the Game of Thrones? on April 11, 2019, 11:34 a.m. The Game of Thrones series has taken the world by storm since its release and given us eight years of intense drama and nail-biting twists and reveals. As fans prepare to bid farewell to Westeros with the final season premiering on 14th April, we asked people who according to them will assume the iron throne. Jon Snow appears to be the frontrunner to win the throne across countries and continents. In India, nearing 1 in 3 people (28%) are most hopeful he will occupy the throne, while a fifth (19%) believe it will be the Night King. A YouGov survey in the US revealed that a quarter of people (25%) believe Jon Snow is going to take the throne. In the UK, 1 in 5 (22%) think the same. World over, Jon Snow is showered with a lot of female attention. In the UK, a higher number of women want to see him on the iron throne, compared to men (35% women vs 27% men). However, in India, a higher number of men state he is their favourite character (21% men vs 9% women) and also believe he is the most likely to win the game, as compared to women (31% vs 25%). Women agree with the view of Jon Snow taking the iron seat, but when it comes to their favourite character from the show, Arya Stark is the winner. 1 in 7 people (14%) feel Daenerys Targaryen will reclaim her ancestor’s throne, while 1 in 12 (8%) feel Sansa Stark will occupy the iron seat. Interestingly, 1 in 25 (4%) say nobody will get to claim it while 1 in 10 (11%) believe the throne will be destroyed. Cersei is believed to have the least chances of claiming the throne, with just a 7% saying she will win this war. Even though some people feel the Night King will be the next monarch, just under half (48%) feel he is doomed to die. On the other hand, over two-thirds are sure Jon Snow and Arya Stark will definitely survive till the end. Ned Stark’s death seemed to have shocked people the most, followed by his son, Robb Stark’s death. Men found Robb’s passing as shocking as his father’s and a higher number of men felt this blow as compared to women (17% men vs 5% women). Close to a quarter (23%) want to revive Ned Stark in the show but the next popular choice for reincarnation is Khal Drogo, and then Robb Stark. Apart from giving fans a lot of memorable characters to cherish, Game of Thrones has given its admirers a lot of favourite moments and lines. ‘Valar Morghulis’, a Braavosi greeting in high Valyrian language, which means "All men must die", is the favourite one-liner from the show, after the most popular phrase ‘Winter is Coming’. Coming to the fans of the show, 2 in 5 respondents (40%) have watched all the seasons of Game of Thrones, either once or more than that. Of these fans, more than 8 in 10 (83%) like to watch the episodes as soon as they are out while the rest (18%) like to binge-watch a season. In order to refresh their memories before the final season, more than 3 in 5 people (62%) have watched the season roundup videos on YouTube or somewhere online, half (50%) have viewed one or more seasons, under half (45%) have read summary articles online and a quarter (26%) have taken a download from friends. 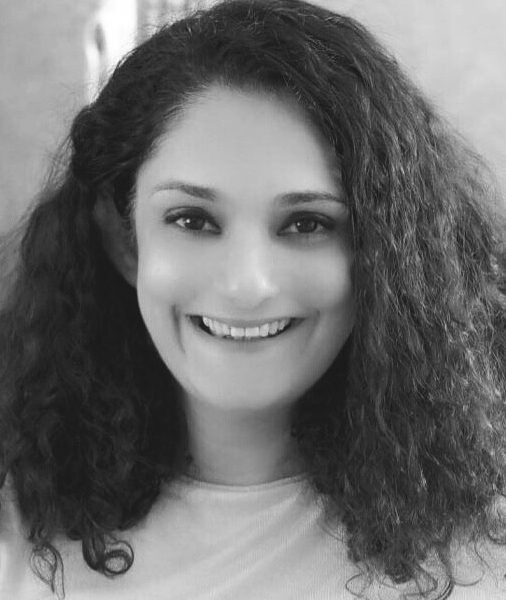 Data collected online by YouGov Omnibus among around 500 respondents in India in April 2019 using YouGov’s panel of over 6 million people worldwide. Data is representative of the adult online population in the country.